Don’t ask my how I’ve done it, but I think I’ve convinced Simon Watkins and a couple more of our friends to chat about the election on tape. I just thought, it’s what we’ve been doing for the last two months anyway, so why not record our ramblings and put it out as a podcast, right? So that’s what I’m doing. On Thursday 7th May (Election Day, make sure you get out there and vote!) 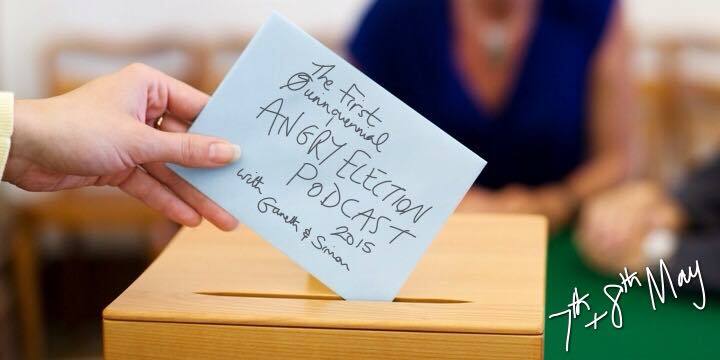 we’ll be releasing Part One of what I’m calling The Angry Election Podcast, featuring me and my good friend Simon Watkins. 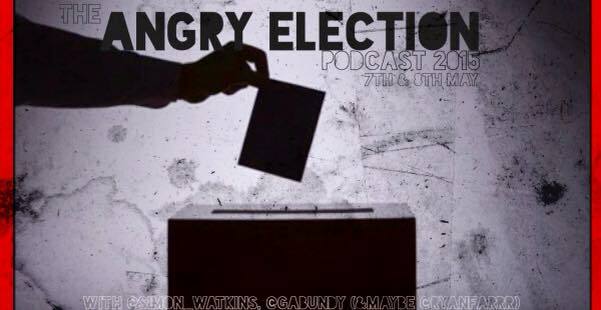 In this podcast we’ll talk about what the outcome would be in an ideal world, what’s likely to happen and what we’ve thought about the campaign efforts of the political parties this election. It’s bound to be chatty and messy and maybe a little sweary, but hopefully lots of fun. We’re recording this first part on Wednesday but putting it out with as little editing as possible the following morning. We want to keep the spontaneous mood intact. Then, on Friday 8th May (the day after the election, when we’ll hopefully know who’s boss), we’ll record an “As-Live” Part Two, covering the ins and outs of election night, the result, our reactions to the result and what it’s likely to mean for the country. We’ll also be running down our best and worst moments of the election season 2015. Hopefully this is the part where we’ll have some guests; since both parts are hopefully going to be recorded in the pub, who we get as guests will depend on who’s out and willing to join in. Again, it’ll hopefully be a lot of fun. None of us are experts on politics as I’m sure a glance at our Twitter feeds will prove, so don’t expect a master-class: we’re just some friends in a pub talking about the election. Also, we’re recording it through an iPad 2’sin-built mic so the sound quality may not be perfect, but it’ll do. We’ve tested it and you’ll be able to hear us speak, at least. And we’re all pretty left-wing, so don’t expect an unbiased and impartial approach, we’re likely to be using a lot of colourful language when talking about the Tories in particular. You have been warned. So, yeah. 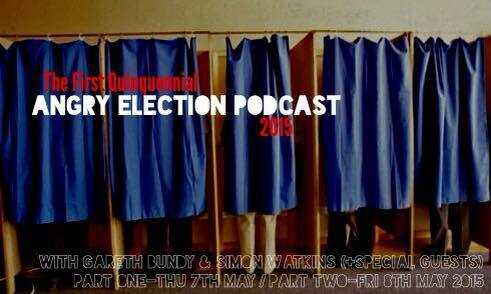 Our “Angry Election Podcast” will be available to download from SoundCloud for free on Thursday and Friday next week. I’ll post all the relevant links here and on my Twitter page as and when. If you want to get involved then send me your favourite moment of the election (here in comments or on Twitter @gabundy) and we’ll read some out in Part Two! I hope so much you’ll have a listen. I promise it’ll be good fun if nothing else! ← Not The Droid We’re Looking For?